This incredible San Diego Padres Executive Pen with authentic dirt from Petco Park is a great gift for the sports fan in your life. It is a perfect practical way to show your fandom to your team and the recipient will love it for years to come. This ball point pen writes in black ink and also comes with a functional stylus at the top for your smart phone or tablet. 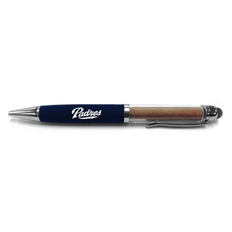 This pen also features the team logo and colors. The dirt inside this pen is MLB Authenticated and comes complete with a MLB Hologram and Steiner Sports Certificate of Authenticity.